The Fred Olsen Braemar invites her passengers to sail onboard and experience traditional style cruising with a friendly atmosphere. Braemar is a typical Fred. Olsen cruise ship weighing 19,089 tonnes and offering an intimate and traditional cruising experience. The ship has huge expansive windows, good sized terraces and large open decks. Braemar is an attractive ship. She features a glass walled atrium which stretches elegantly over five decks, adding to the beauty of the intricately designed exterior. Fred. Olsen cruises offer a unique range of friendly and intimate cruise experiences where passengers are encouraged to engage and interact with each other. This helps to create the tight nit, family atmosphere that Fred. Olsen cruises are known for. 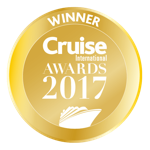 Braemar travels the globe on Caribbean Cruises, Mediterranean Cruises as well as taking in the Latin flavour of South America. Menus onboard the Fred Olsen Braemar are prepared to a high standard by award-winning chefs, and food is served by staff who are friendly and attentive. The main dining lounge, The Thistle restaurant, provides a traditional dining experience in an atmosphere enhanced by large windows and sea views. In addition to the exquisite food, is an extensive wine list which helps to compliment and complete your meals perfectly. Other less formal dining options are also available onboard Braemar including the Palms Café with carved mural decor and the Coral Club with its sublimely comfortable tub chairs. As you watch fabulous sunsets, Braemar turns her attention to the evening schedule of attractions and entertainment. The Neptune Lounge transforms and a shimmering backdrop gives the stage a certain glamour. The Coral club is the venue where you can be entertained by classical music and dancing. Alternatively, for a truely magical experience take your Foxtrot or Salsa outside and dance the night away under the stars on the Sculptured Terrace. Onboard Fred. Olsen Braemar is a fully equipped fitness centre with weights, resistance machines and a large dance studio that plays host to group sessions. The range of fitness and activities allow you to keep up with your healthy lifestyle whilst onboard or pick up a new healthy regime. The Braemars sauna and solarium provide the perfect opportunity to wind down, relax and recharge your batteries leaving you refreshed and looking your best to enjoy your cruise holiday. Additional facilities include the sun drenched deck swimming pool and luxurious Jacuzzi. Other facilities onboard Braemar include shops that offer a wide variety of goods from stylish fashions to famous name perfumes and much more. Adjacent to the four-deck atrium is the library where passengers can relax in comfortable mahogany chairs and catch up on some reading in the plush surroundings of red and russet tones. Fred. Olsen offer a comprehensive array of themed cruise experiences, which allow passengers to combine their hobies or interests with a amazing cruise experiences. Themes available range from food and wine, featuring professional lectures, to golf cruises which give you the opportunity to improve your game under expert tutorage. Overall Fred. Olsen Braemar provides an intimate and relaxed cruise where your everyday life is put on hold, allowing you to take time and focus on enjoying your experience. Wonderfully relaxing cruise with great staff, They couldn't have done anymore for us. The food was excellent and the entertainment team were the best we have ever seen on a cruise, We had very rough seas for the first 3 nights but no-one can be blamed for that. We loved the cruise and have booked another one for 2 years time. Had a wonderful time. Staff brilliant.